The earliest record of chocolate was over fifteen hundred years ago in the Central American rain forests, where the tropical mix of high rain fall combined with high year round temperatures and humidity provide the ideal climate for cultivation of the plant from which chocolate is derived, the Cacao Tree. The Cacao Tree was worshipped by the Mayan civilisation of Central America and Southern Mexico, who believed it to be of divine origin, Cacao is actually a Mayan word meaning "God Food" hence the tree's modern generic Latin name 'Theobrama Cacao' meaning ‘Food of the Gods’. Cacao was corrupted into the more familiar 'Cocoa' by the early European explorers. The Maya brewed a spicy, bitter sweet drink by roasting and pounding the seeds of the Cacao tree (cocoa beans) with maize and Capsicum (Chilli) peppers and letting the mixture ferment. This drink was reserved for use in ceremonies as well as for drinking by the wealthy and religious elite, they also ate a Cacao porridge. East Chocolate recipes can satisfy just as much as the more difficult ones. - Combine first 4 ingredients in a large bowl, stirring until smooth. - Shape dough into 1-inch balls, and roll in pwdered sugar. Place balls 2 inches apart on lightly greased baking sheets. And their elite soldiers carried a sort of chocolate bar with them that they could grind up in the field for a daily dose of chocolate. You can't go wrong with an easy chocolate cookie. They look fantastic. 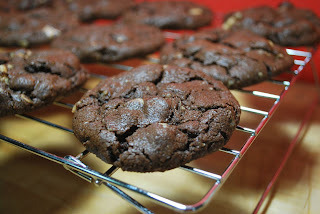 Chocolate cookies?! Um, yes please!! Wow - cookies made from cake mix? That looks easy AND delicious! they look lovely - and really chocolatey. Would never thought of making cookies from cake mix . Make sure to follow my blog to get the latest recipe you wouldn't resist!